First, two things. 1) It’s good to be back. 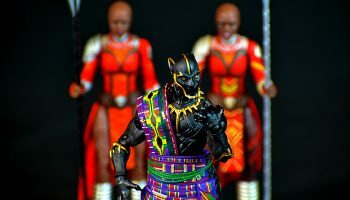 I’ve been through a lot in the last couple of months and unfortunately, BlackActionFigure.com was not one of my priorities. I’ve lost a job, found another (better) job, got really sick twice, and other stuff. It’s sometimes hard to find the right motivation to do the stuff you enjoy when real life takes precedence. 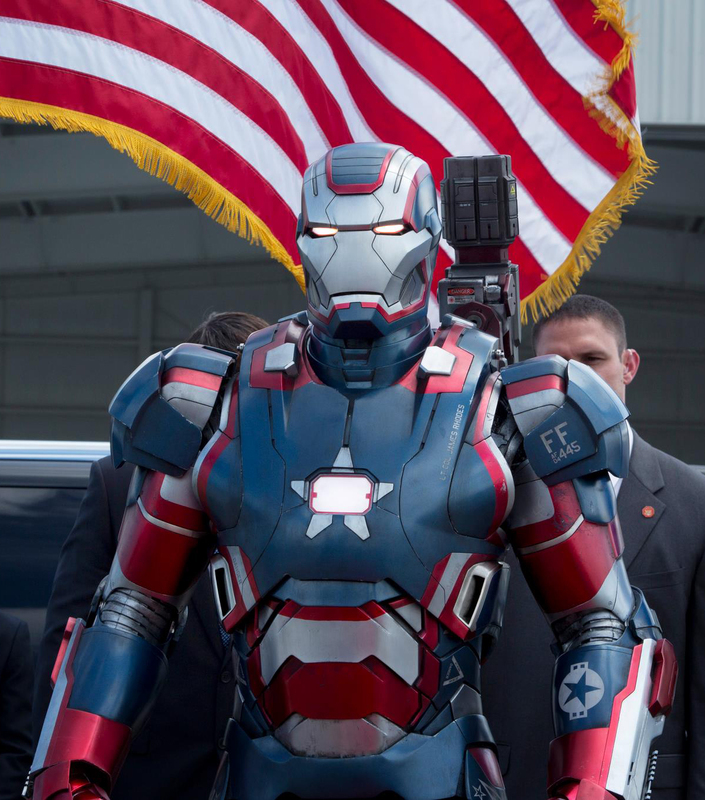 And the next: 2) I am probably one of the few in America who has not seen Iron Man 3 yet. But I have a really good excuse (sort of). My wife went out of town for a couple of weeks and I have been taking care of the kid by myself (much respect to single parents, I understand a little better now). During that time, I have missed watching Iron Man 3, Star Trek: Into Darkness, and Fast and Furious 6 comes out tomorrow…I’m way behind. Not often do I talk up Hasbro especially with their shoddy release schedule and uneven distribution (I’ll get into that later). With that in mind, I really like what they did with their movie 6″ line. Instead of barely acknowledging the fact that the 6″ movie line works along with their Marvel Legends line, they effectively roll the former into the latter. And the packaging nicely reflects that. 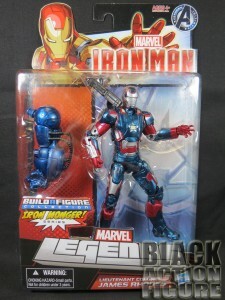 The bottom two-thirds of the blister card looks exactly like their recent Marvel Legends line, which I see as a plus. The top half is what signifies this as part of the “Iron Man” line. To some, it may seem like they have combined some of their processes reducing some production costs. 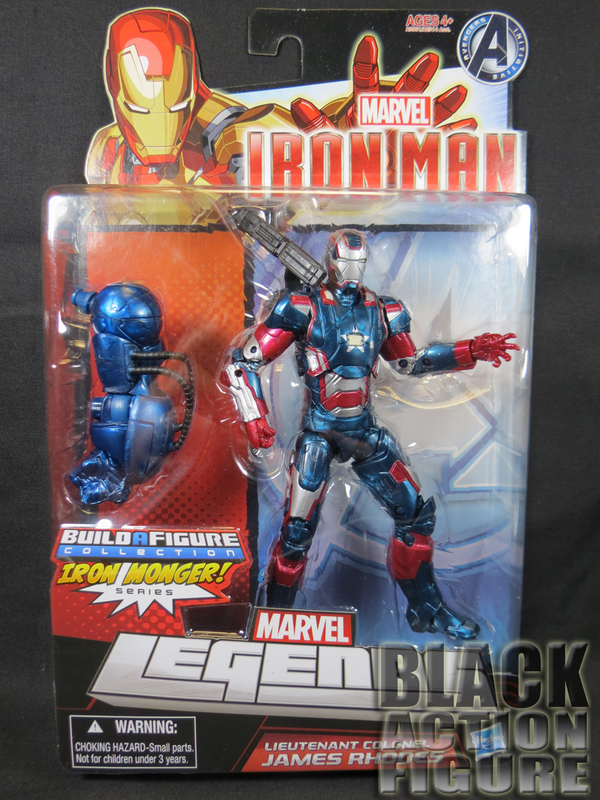 To me, it effectively properly recognizes all Marvel 6″ figures as “Marvel Legends”. Prepare to see more of this when the Wolverine movie comes out (more Marvel Legends!). 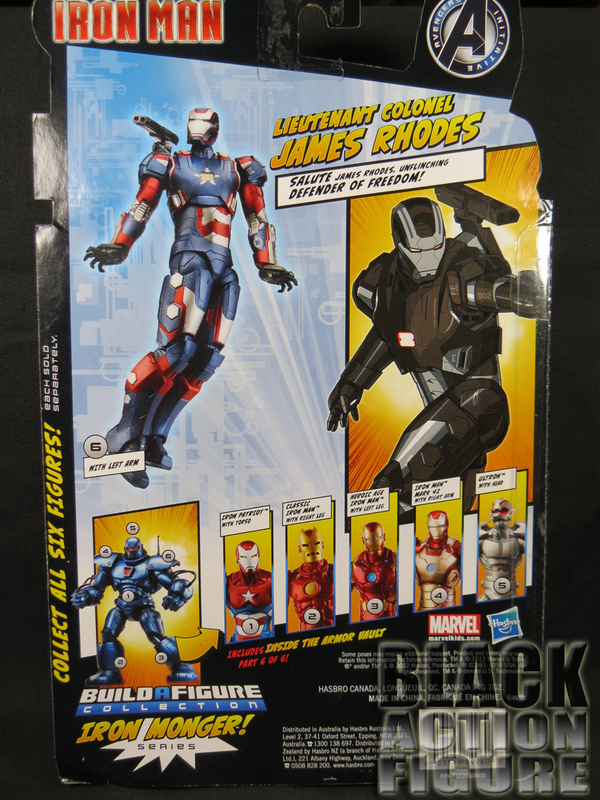 Unlike the Avengers movie 6″ line, we actually go back to the “Build-A-Figure” (good-bye semi-useless stands) and along with the figure is a prominent piece of the Build-A-Figure of this line, Iron Monger. There are no real accessories to talk about really besides the figures shoulder cannon. The shoulder cannon itself has two points of articulation and can be placed over either shoulder. As mentioned before, this figure also comes with a “Build-A-Figure” piece of Iron Monger (the left arm). I can’t really count this as an accessory, but it was worth mentioning. Other than that, not sure of what other accessories would have worked in this line. 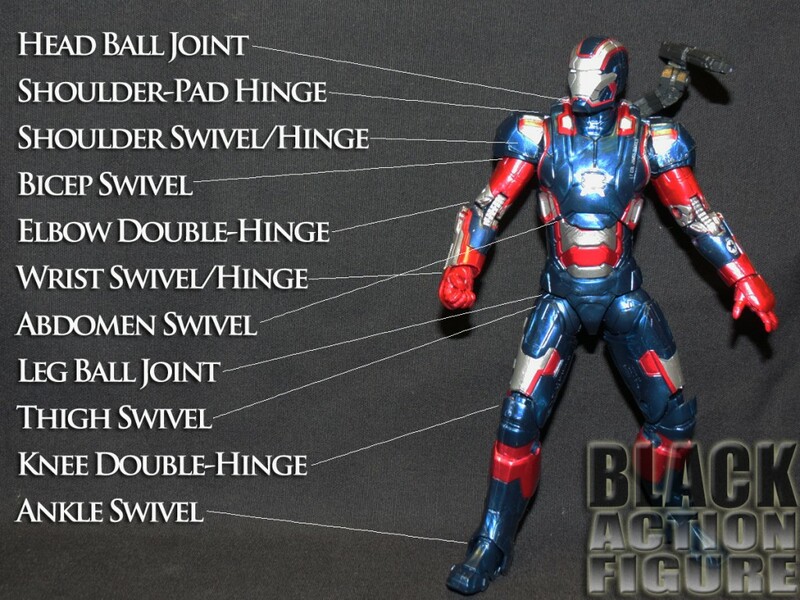 Six inch Iron Man figures in the past have sometimes come with multiple replacement hands in different positions, and this would have been acceptable in this case, especially since the prototype on the back shows two open hands but the final version has a closed hand and an open hand. Kind of nitpicky, but that may have made this figure a little more customizable. As it stands, one accessory (even though a main one) gets only an average score. Two things instantly capture my attention on this figure. 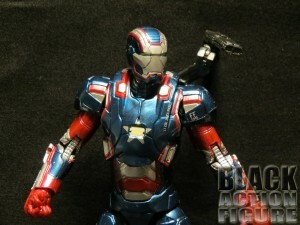 First, it is painted beautifully, with metallic reds, blues, and silvers which accentuate the final figure. 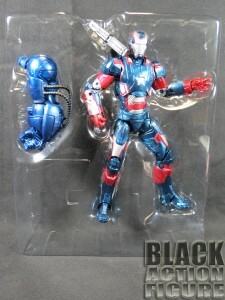 Second, this figure to me is extremely detailed. Along with the movie accurate paint job, we get an exceptional sculpting job. The detail placed into this figure actually makes me happy to pick this one up. In fact, this whole line has been pretty great. 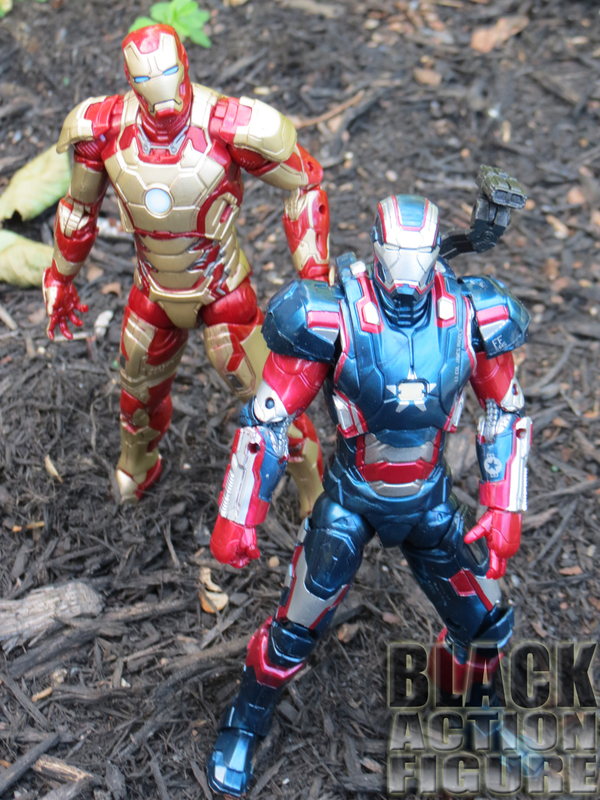 The Bleeding Edge Iron Man, Classic Iron Man, and comic Iron Patriot started this line with a bang…the second wave with this figure, Iron Man Mark XLII, and comic Ultron (not to mention the Iron Monger B.A.F) have me wishing Hasbro continues to put out more figures of this caliber. You know how you can tell if a figure is detailed? Turn it around and check out the back. 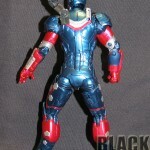 If the back is as detailed as the front, then the figure was sculpted with good detail in mind. 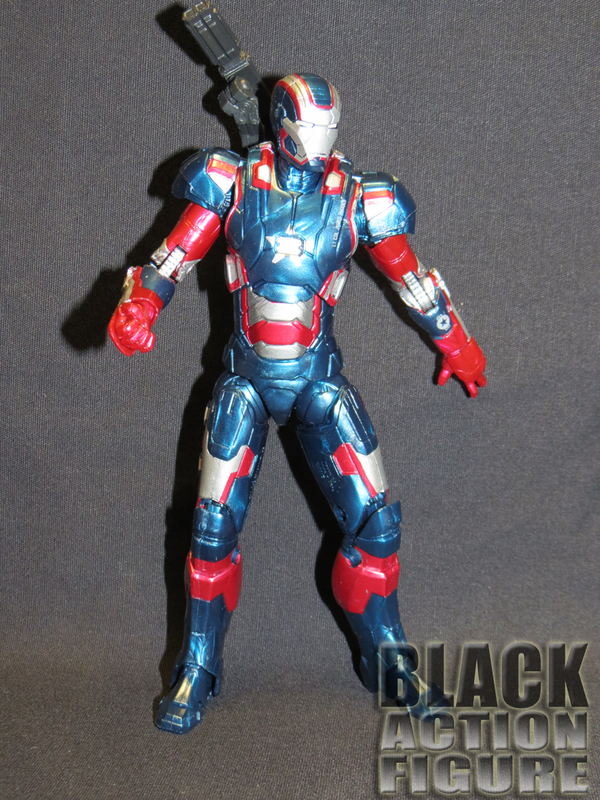 Depending on how you count, this figure has an amazing 28 points of articulation! 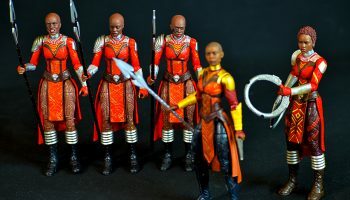 I say it depends on personal opinion because some people may not count the Shoulder-Pads as articulation (which still gives it a still-amazing 26 points). Some people may even count the attached accessory which adds two more points. No matter how you count it, Hasbro did an excellent job articulating this figure. There are still some faults though. I believe the ankle was to be a little more articulated, but the armor covering the ankle prevents it from its intended range of motion. The shoulder pads hinder full range of arm motion. And while the prototype on the back of the card shows that the wrist should be able to bend back, again, the armor prevents that from happening. Earlier I said I would speak more on distribution, so I will. Hasbro’s distribution is pretty jacked up. 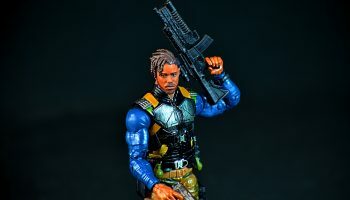 The first wave of these figures saturated the market and can still pretty much be found at any store you walk into including Kmart, Walmart, Target, and Toys R Us. Not to mention a number of online retailers. So the first wave got people excited about the line. 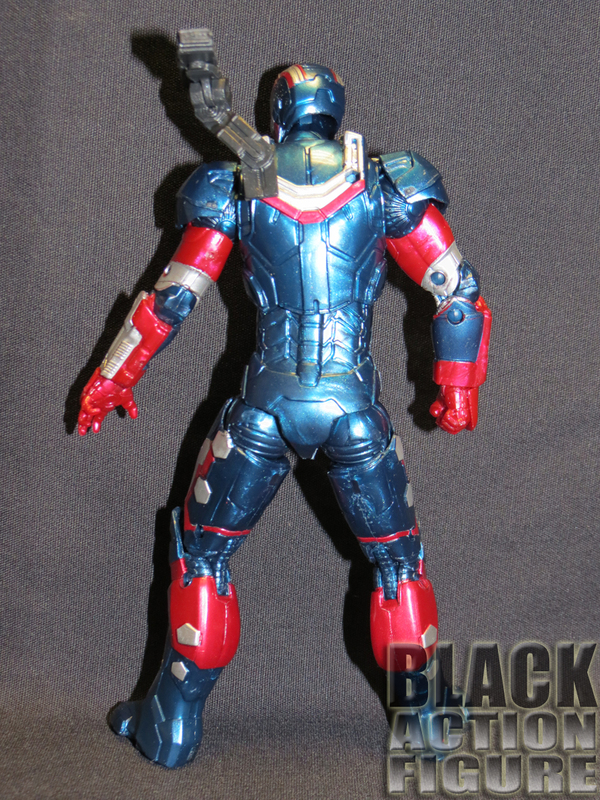 Review: DC Collectibles New 52 Cyborg!